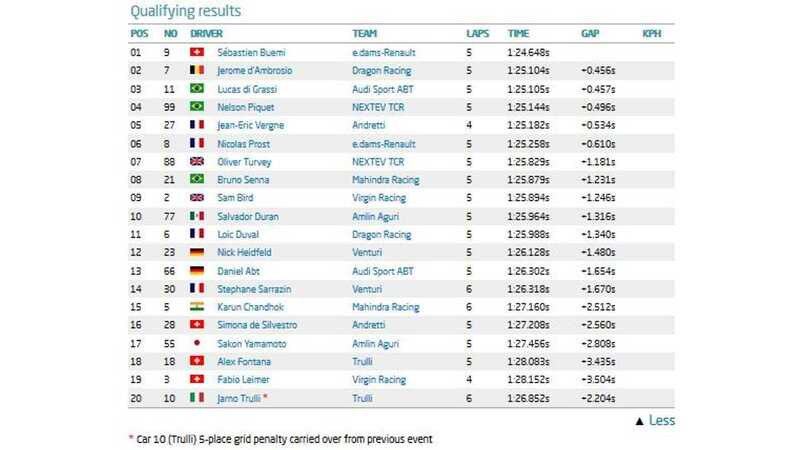 Sebastien Buemi claimed Julius Baer pole position ahead of today’s Visa London ePrix four tenths clear of Jerome D'Ambrosio (Dragon Racing) and Lucas di Grassi (Audi Sport ABT). Buemi, who set his time during the fourth qualifying segment, brushed the barrier at the final corner on his fastest lap as the drivers scrambled to get a good grid position. Qualifying at the front of the pack may be even more crucial than ever now the race will start behind the Qualcomm Safety Car after track changes were made at Turn 1. 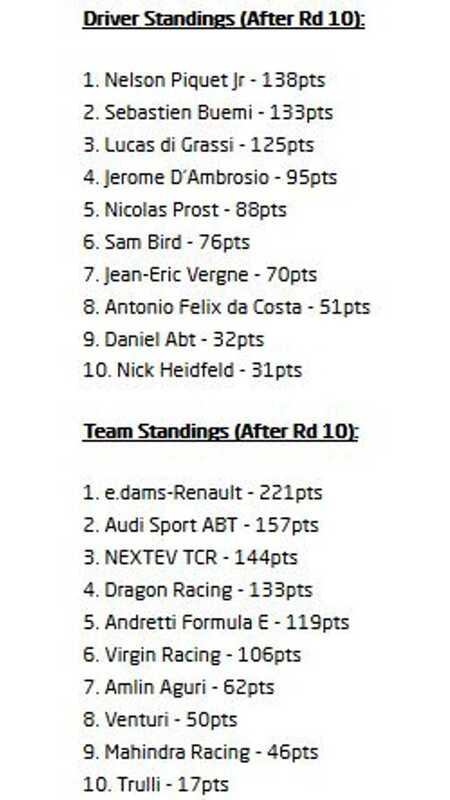 D’Ambrosio, who also ran in the final qualifying group, set the second quickest time and demoted long-time pacesetter, Lucas di Grassi to third place on the grid with the Brazilian driver reporting that he was struggling with too much front locking. Championship leader Nelson Piquet Jr ended the session fourth quickest and the NEXTEV TCR driver was clearly pushing hard as he locked up and ran close to the barrier several times on his quick laps. Jean-Eric Vergne will start from fifth place for Andretti, but the French driver was forced to take to the escape road on his first flying lap as he locked the rear wheels and spun at Turn 7. Nicolas Prost will start in seventh place for e.dams-Renault, ahead of Formula E debutant Oliver Turvey and Mahindra Racing’s Bruno Senna. 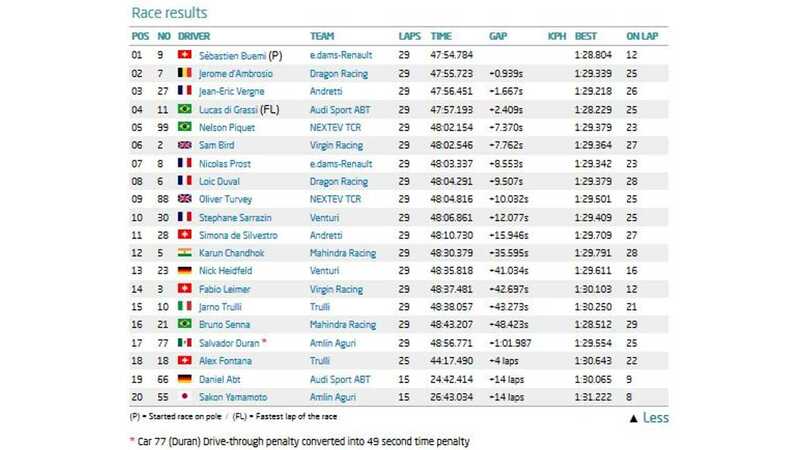 Virgin Racing’s Sam Bird will start in ninth, with Salvador Duran rounding out the top 10 for Amlin Aguri. Bird had needed to take pole position to keep his slim championship chances alive, but after failing to do so he has now been mathematically eliminated from the title fight. Karun Chandhok will start in 16th in the second Mahindra entry as the Indian driver crashed at the final corner and broke his right-front wheel. Sebastien Buemi went for a metaphorical walk in the beautiful Battersea Park and came back with a fighting chance of winning the FIA Formula E Championship. Pre-weekend the e.dams-Renault driver was 23 points behind Nelson Piquet Jr in the standings, but his second win from pole position (and his third win in total) has reduced that deficit to just five points. Buemi did it in style too. With a temporary barrier erected in order to avoid a huge bump on the entry to Turn 1, it was agreed that the race would start behind the Qualcomm Safety Car. Buemi timed his getaway to perfection to ensure he was under no pressure into the next heavy braking zone at Turn 3. In the second half of the race Daniel Abt crashed his Audi Sport ABT car into the wall on the exit of the final corner, erasing all of Buemi’s advantage, but once again he nailed the restart to score a resounding win. With team-mate Nicolas Prost finishing seventh, it was an especially good day for e.dams-Renault who became the first ever Formula E teams’ champions. In contrast it was a testing day for Piquet and his NEXTEV TCR team. From fifth on the grid he was always going to have his work cut out to move forward on the tight, heavily-cambered Battersea Park track. But he quickly got onto the back of Lucas di Grassi and had a good run for third. As they went side by side the cars touched on the straight and Piquet was forced to run deep into the chicane and very nearly hit the wall. With his exit heavily compromised, Jean-Eric Vergne took full advantage to nip by and steal fourth. After the car-swap pitstop, Piquet was once again on di Grassi’s tail. This time he used his FanBoost to almost draw level with the Audi Sport ABT entry, but di Grassi defended well and in the closing stages upped his pace to pull well clear. Indeed di Grassi set the Visa Fastest Lap during his late surge, and combined with fourth place, it means he’s now just 13 points behind in the championship. Despite a very strong race to second, Jerome D’Ambrosio’s slim title hopes have ended, but the Dragon Racing driver was still very pleased with another podium finish. After passing Piquet, Vergne closed down di Grassi and with all four wheels locked up, pulled off a great passing move for third. In the second part of the race his pace was limited by a power issue, but he was still pleased with third. 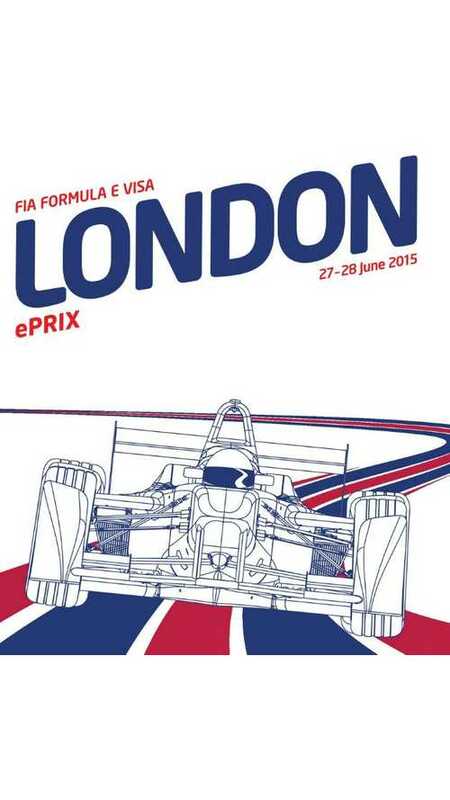 Like D’Ambrosio, Prost and Sam Bird saw their slim title hopes end in Battersea. After a troubled qualifying, Bird was fast in the race, but a slow pitstop cost him a shot at a top-five finish. Still he overtook Prost and Loic Duval, who was suffering with a lack of top speed, in the closing stages to take sixth. Duval finished eighth for Dragon, while Oliver Turvey was the best-placed of the five debutants, coming home ninth. It should have been much better, but an over-long pitstop cost him at least two places. The final point went to Stephane Sarrazin. The Venturi driver had been quick all day, but a mistake in qualifying cost him dearly. But with Bruno Senna (Mahindra) and Salvador Duran (Amlin Aguri) picking up pitlane speeding penalties, he was promoted into the points. Now they all have to do it again. Piquet still holds the lead, but with just 13 points separating the top three – and the incredibly tricky nature of the circuit – it genuinely is too close to call. e.dams-Renault secured the team title, but the driver title is still up for grabs leading into the final race.